Lacrosse is a team based field sport that is both highly technical and physical. The nature of the sport requires elevated levels of maximal strength, acceleration power and deceleration power. Lacrosse is based on powerful movements fueled by the anaerobic energy system. Like many field sports, lacrosse also requires an athlete to perform these powerful movements repeatedly with varying intensities. For these reasons, lacrosse is defined as an anaerobic dominant sport (70%) supported by aerobic components to facilitate recovery (30%). IFA has prioritized three primary performance factors in the development of a comprehensive strength and conditioning program for lacrosse athletes: development of strength, rotational power, lateral quickness and an emphasis on preventing injuries which most commonly occur in lacrosse. Lacrosse is still relatively new and growing within high school and university settings. Athletes in less recognized varsity sports may be less likely to receive proper instruction in strength training and sport-specific conditioning. Strength and conditioning can greatly impact a team’s success, and an improper training regimen may result in less than optimal achievement. Due to lacrosse’s physical and aggressive play, strength becomes an essential attribute to all players. Strength is defined as the ability to overcome or counteract external resistance by muscular effort. Inclusion of multi-joint, barbell-based, and open & closed-kinetic-chain resistance movements are the primary form of strength development within IFA programming. These movements include squatting, deadlifting, pressing, and other various movements where athletes are tasked with producing force into the ground while maintaining structural alignment. These movements are the most effective means of developing strength for athletes because they allow an athlete to move the largest amount of weight while focusing on their body as the base of support. Closed-kinetic chain movements, specifically, have a higher transfer of training effect to specific sporting movements. The more force an athlete can apply into the ground, the faster they can run, jump, and change direction. Structural strength training translates to performance increases in various aspects of athletics. Players who work with free weights exhibit increases in strength, speed, and quickness. Elevated levels of relative strength are a prerequisite for the development of power. An athlete who can produce more powerful movement will be more dynamic on the field. The motor patterns utilized within lacrosse place a high degree of stress on lateral and rotational movements. 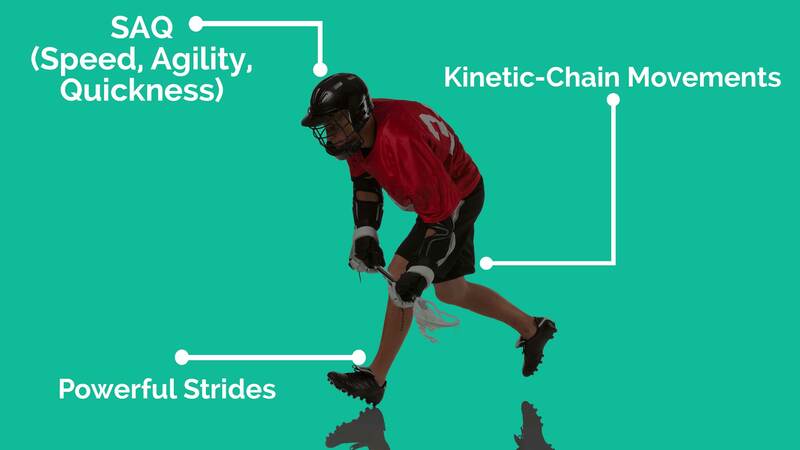 Rotational strength, power, stability, and mobility are undoubtedly the training staples of lacrosse, as the sport is highly rotational and multi-planar. IFA institutes a progressive resistance-training program to develop the strength and stability of the core musculature. Abdominal and lower back strengthening are key variables in developing dynamic stabilization, which is defined as: the rigid stabilization of a body segment by surrounding musculature, allowing only movements dictated by the skill being performed. Dynamic stabilization of the trunk is a necessary base for the development of rotational trunk musculature. Resistance exercises involving diagonal-rotational movements span a greater range-of-motion and are more sport specific because they follow the natural movement pattern in most of sport skills. The body’s core musculature is oriented diagonally and with a crisscross design. This chain of muscles is best developed through Olympic lifts, squats, presses and pull-ups which, when combined with rotational exercises allow athletes to apply their strength from traditional lifts in rotational movements. Explosive and ballistic medicine ball training is added with the goal of transitioning strength into power-based rotational movements. Medicine ball training is an effective way to increase performance for athletes involved in rotational power sports such as lacrosse. When implemented as part of a progressive resistance-training program, an athlete will be better equipped for their sport and their performance will improve. Using the principles of the stretch-shortening cycle, the muscular chain associated between the hips, trunk, and shoulders is stretched and helps to promote explosive recruitment of concentric muscle action. Development of not only the structural integrity of spinal stability, but the forceful and efficient utilization of rotational power movements will help lacrosse athletes develop sport-specific strength associated with both offensive and defensive play. In lacrosse, there is a need for multiple expressions of speed, quickness, power and reactiveness. Lateral acceleration and deceleration training are essential in a lacrosse strength and conditioning program. One-on-one confrontations rely on lateral movements, both to evade an opponent on offense and to stay with and contain an opponent on defense. Improving lateral quickness involves improvement of an athlete’s physiological, physical, neurological, technical, and tactical abilities. The intermittent nature of the sport places a high demand on change of direction ability. An athlete who can change directions quickly is able to do so because of their ability to slow the momentum (deceleration) of their body with eccentric loading of the lower-extremity. To improve deceleration, muscles of the lower extremities need to be stressed to eccentrically contract in multiple planes. Deceleration training will overload the body through momentum in all planes, which will lead to improved explosiveness. Athletes can develop elevated levels of lateral quickness or change of direction (COD) ability with progressive training of eccentric and concentric control of single limb movements. Exercises involving unilateral stance stress the dynamic stability of the athlete. Dynamic stability is stated to be an essential component of change-of-direction ability and multidirectional speed. IFA implements various unilateral progressions that place the lower-extremities through increasingly complex levels of both concentric and eccentric stress. Athletes will comfortably and safely develop the necessary strength for efficient and effective unilateral control for sprint deceleration and COD abilities. In conjunction with strength development, IFA implements a progressive speed, agility, and quickness (SAQ) program. IFA SAQ places a training demand on the ability of an athlete to execute change of direction tasks from simple to complex drills. Using plyometric drills, cone and ladder drills, and other movement challenges, athletes will improve multi-directional quickness and jumping and landing mechanics. Training movements with demands on jumping mechanics can help to improve change of direction ability.